Scarred Scafell Pike: The struggle to control erosion on England’s highest mountain - Mend Mountains. Make One Million. With foot traffic at an all-time high, paths on England’s highest mountain are being eroded faster than they can be repaired. We speak to Fix the Fells ranger Liam Prior about the huge challenge of getting the damage under control – and what Mend Our Mountains is doing to help. For the last three decades the National Trust and Lake District National Park Authority have been engaged in a ‘painting the Forth Bridge’ task – trying to heal erosion caused by footfall on the Lake District’s hugely popular fells. Formed 17 years ago, the Fix the Fells partnership now leads this work. With funding tight, visitor numbers booming and extreme weather events hammering the hills, the partnership has its work cut out. Nowhere is this more true than on England’s highest mountain, Scafell Pike. The most popular route up Scafell Pike is the Brown Tongue path from Wasdale. As the most direct way to get to the roof of England, it sees a whopping 100,000 walkers a year and is the usual route taken by participants in the Three Peaks challenge. In 2016 the BMC’s first Mend Our Mountains campaign raised £17,387 towards the ongoing task of maintaining the Brown Tongue route. This was enough to repair a section of path, part of which you can see in the ‘before’ and ‘after’ picture below. But this was only one part of one route on a mountain with many different paths. That’s why the Mend Our Mountains: Make One Million appeal, which kicks off in earnest in March, is aiming to raise a cool £100,000 to fund a concerted effort by Fix the Fells to get erosion across the whole mountain under control for the foreseeable future. Liam Prior is a Fix the Fells ranger who is on the frontline of the effort to repair Scafell Pike’s paths. We spoke to him about the work of the partnership and the particular challenges of path repair on one of England’s most heavily-trodden paths. Traditional path repair techniques have been developed over centuries. We are simply the latest in a long line of communities who understand their importance. Upland path work is a lot about psychology. You try and understand how people are enjoying a particular mountain. By understanding this we aim to provide a sustainable route in keeping with the landscape that subtly encourages a high proportion of people to use it and therefore minimises erosion on the fellside. Every mountain is different, every section of path is different. Our challenge is to come up with site-specific solutions that work within the landscape. Any work that we carry out is tough, physical work. It often involves a long walk in and out, carrying tools and sourcing any materials that we may require from the landscape itself, so if a stretch of path isn’t showing signs of erosion we won’t be working on it. The options are endless and take a lifetime to master. Stone pitching is the most intrusive and time consuming technique, and only utilised when there are large numbers of people, a steep slope and lots of water present. All other less intrusive options have to have been explored first. Where no erosion is occurring the route will go untouched. Without stone pitching it is safe to say that there would be vast erosion scars running up and down all of our more popular fells. 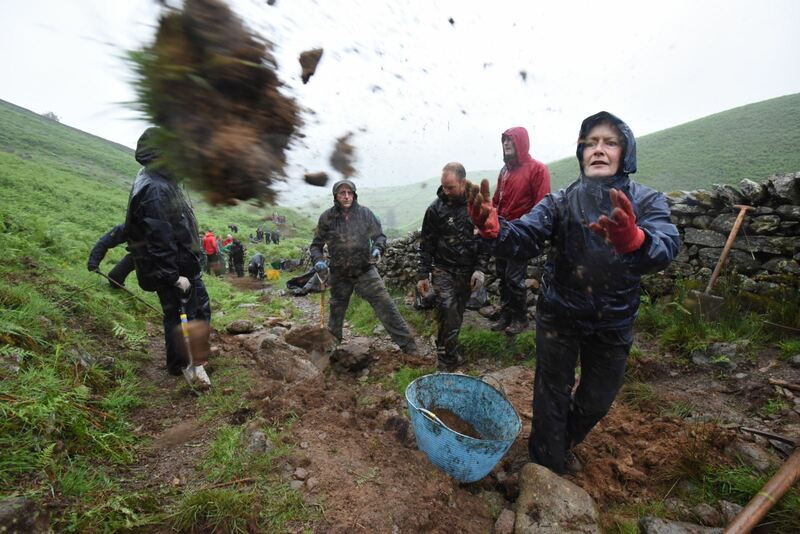 It involves digging in stone steps that stabilise the fellside and provide a solid footing that encourages people to walk on the stone, while also coping with water running over it. Scafell Pike and the popular route up Brown Tongue to Hollowstones is a case in point. This is because of the huge numbers of people, the steepness of the route, the presence of running water and the sheer scale of the erosion. Brown Tongue has been suffering from erosion for a long time. As the numbers of people continued to grow through the eighties and nineties the signs of erosion spread. More and more sections of pitching were installed until the path from Lingmell Gill to Hollowstones was a near continuous stretch of stone pitching. This is an incredible body of work carried out by skilled professionals over many years. If the numbers of people climbing Scafell Pike had continued to grow at a slower rate the path would have been sustainable. But with the advent of challenges like the Three Peaks, the increasing popularity of hill walking, the chance to walk to the top of England, and the beauty of Wasdale, more and more people are climbing Scafell Pike, with 85,000 people climbing from Wasdale alone in 2017. The unintended consequences of this are erosion scars opening up at various points up and down the mountain. Today we have a dedicated upland team to tackle erosion. It exists because of donations to Fix the Fells, car parking fees, memberships with the National Trust and campaigns like Mend our Mountains. As we work on Scafell Pike there is often a continuous line of people climbing and descending the mountain at the same time come rain or shine. In places the path simply isn’t wide enough to cope. Footfall has trampled the vegetation on the edge of the path, compacting the soil and killing off the vegetation. The act of compaction means water runs over the soil rather than soaking through it, and without the vegetation to hold it together, erosion occurs. The results of this can be seen in the ‘before’ picture above. This soil takes hundreds of years to accumulate, and can be washed away over months. This can have knock-on effects on fragile habitats, whether on the fellside or downstream in lakes and rivers. When we walk through an eroded section of a route we naturally spread out looking for a better, safer, quicker route. That means that these erosion effects quickly multiply. We identified the work funded by the last Mend Our Mountains campaign as a priority. We flew in additional stone by helicopter to enable us to build a wider path. We installed big foot placements for the downhill walker to have a choice of secure steps to place their tired feet and put in additional drainage to ensure water damage is kept to a minimum. By giving people somewhere secure to place their feet, pass each other and keeping water away from the path we believe it will be a sustainable route. It really is as simple as that. 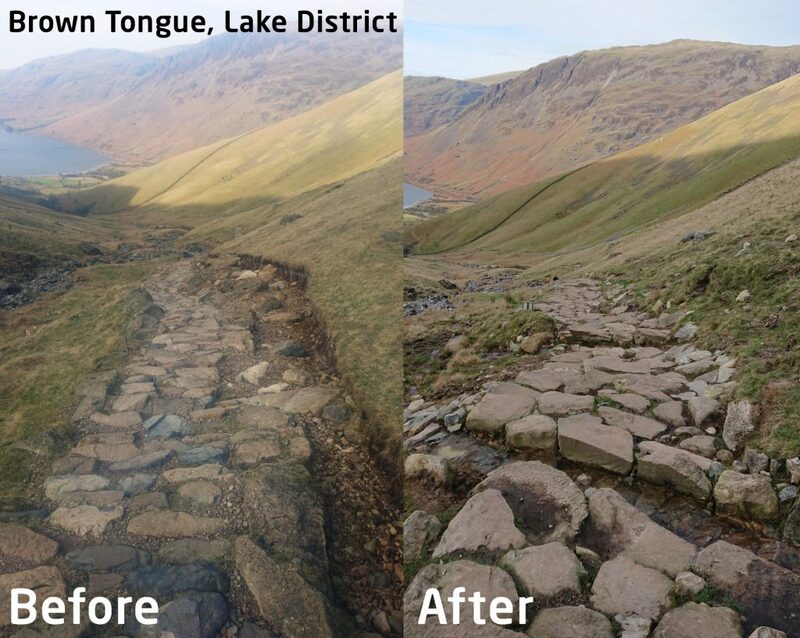 With the past year’s work, we can see that the ‘after’ path will provide a stable route up this section of Scafell Pike. Generations to come will be able to enjoy the landscape with minimal further intervention in it. But we have many more years of work to turn every step on the Brown Tongue into a sustainable route. Campaigns like Mend our Mountains are key to helping us achieve this.